I started this series on the first day of Chinese New Year this year, 2014, to give thanks, pray and remember those of us who may not be in the best of moods to celebrate the new year... My target is to do 15 Days. In today's post, we have a guest post by Mary of SimplyLambChops who has three lovely children, Ch, L and K. At this moment, K is in ICU in hospital, with a complication that could be life-threatening. We pray for K, that she gets well soon. And for Mary and her family. I was 34 years old when I got pregnant with my third child. Based on my age, I had less than 1% chance of having one with Down Syndrome (DS). K, my third child, was medically confirmed to have Trisomy 21, or commonly known as Down Syndrome, after birth. Life after the confirmatory genetic test was heart-breaking, not just for my hubby and I, but to the entire extended family. Many asked if we knew she has DS in utero, and stated all the possible pre-natal testing for DS that we were supposed to take, to see if we missed out any. Some tried to comfort by saying “never mind, since we already gave birth to her, we just have to make the best out of this”. I remember reading more about DS and secretly wished that I hadn’t make that decision carry on with my pregnancy when our gynae told us his suspicion. There were also many days and nights of uncontrollable tears of guilt and sadness. Two years have passed since then. Life has been good. I should proclaim that it has been wonderful! There were definitely frustrating and stressful periods. Probably more than what a parent may get with a “normal” child. For example, we were anxious when K’s weight remained constant for many months, and that it was way off the lowest percentile on the growth chart. She had to be put on the nasogastric tube for a while to boost her weight gain. What added to our stress were the rude stares strangers gave when they see K with the NG tube. Also, K is physically and mentally slower than her peers. She can’t speak our human language yet, and has feeding issues that tire me out as I help her with her feeding therapies. She has a few medical problems too. The sad news is, as I am typing here, she is lying on the bed at the PICU (Paediatric Intensive Care Unit) , critically ill and being supported by the heart-lung machine (ECMO). K brings so much joy to our family and to many of our friends. I give thanks to God for gifting her to us. Through her, I learnt to be a better parent. She has increased my faith in God, and I am strengthened by her fighting spirit even as she struggles to live with the help of the machines. My family has also been more closely-knitted as we learn to be more understanding while we persevere to help her in her daily activities. Through everyone’s loving support and God’s grace, K amazes me with her developmental milestones. She has grown to walk by 2 years old, babbles a few monosyllabic words, is able to wheelbarrow hand walk for at least 3 metres (clap clap!! ), and understands our instructions well. I pray for all those with Down Syndrome, that they will not be judged, or dissed by the society. I pray that they will be socially included and hopefully one day, be embraced by the society. I pray for their health, that they will be able to have a quality of life despite their underlying medical conditions. I pray for them all, that they will be an inspiration to others around them with their warm personalities and talents, and not be hidden away for not being able to contribute to the economy. I pray for those who have the ability to achieve more to do as best as they can, and to persevere through all difficult therapies and challenges. I pray for the parents of those with Down Syndrome, that we continue to have the courage to provide the best we can for our child, to love them and to support them, financially or emotionally. I pray for the parents to have a stronger marriage so that they can stand together to brave through the challenges they face, and give each other the support they need. I pray that the parents will also draw strength from God by being closer to Him. I pray that we be uplifted and encouraged by friends and the community around us. I pray for wisdom for the parents especially when we need to make decisions for our child with DS. I pray for those who are expecting a child with DS that they have the courage and strength to continue their pregnancy, and not choose abortion as the solution. I pray that they will be encouraged by the many successful stories of those who have DS, and to be able to find a good support group in their community. 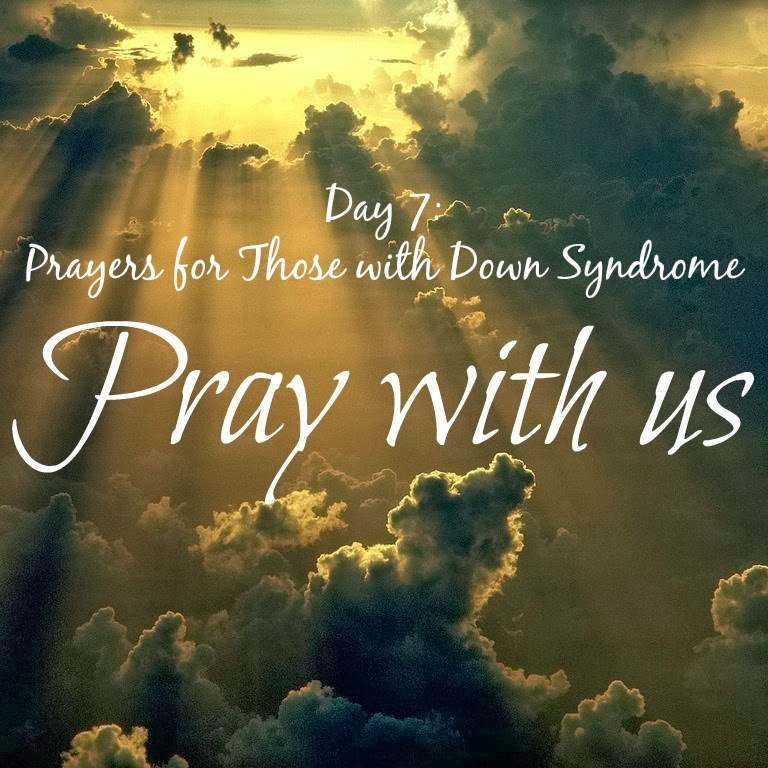 I pray for the siblings of those with Down Syndrome, their caregivers and their extended family that they be not selfish with their love for the one with DS. I pray that they will be patient when daily interactions are frustrating and perhaps, energy zapping. I pray for them that they love the one with DS and shower them with kind, nurturing words and accept them whole-heartedly. I pray for those in the medical field who take care of their patients with Down Syndrome. I pray for wisdom and careful decision making when they decide on the healthcare plan to administer to their patients as people with DS have slightly different responses to the medications and other medical procedures as compared to the general mass. I pray that they do not have any bias which may cloud their judgment and professionalism. **March 21 marks the World Down Syndrome Day and you can help to raise awareness of Down Syndrome. The DSA (Singapore) is organizing a Buddy Walk and Carnival in the heart of Orchard Road on the 22 March 2014 and you can wear socks of different colours to make a statement in support of all persons with Down Syndrome. My heart goes out to you and your family. It is indeed not easy at all to have a child with DS or any other afflictions. And who are we to judge their imperfections? If we surrender everything to God, especially during the times when we can't seem to find strength to carry on, I believe we will see the hand of God lifting us up and shining through the eyes of the child like you have seen in K. Take heart and we will be praying with you.